This wasn’t just another game. 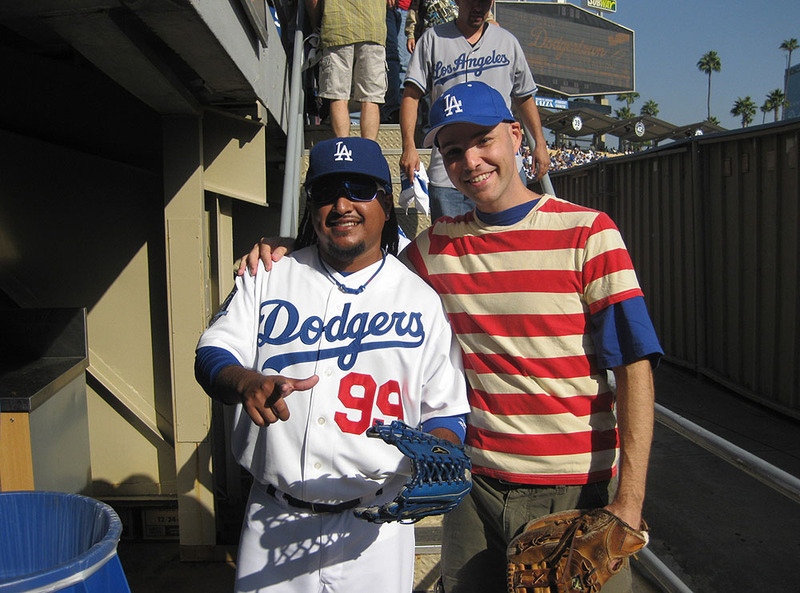 Not only was it the National League Division Series — Cardinals vs. Dodgers — but there was something extra special about it for me: it was the day before my appearance on “The Tonight Show With Conan O’Brien” and I was going to be filmed by a roving camera crew. 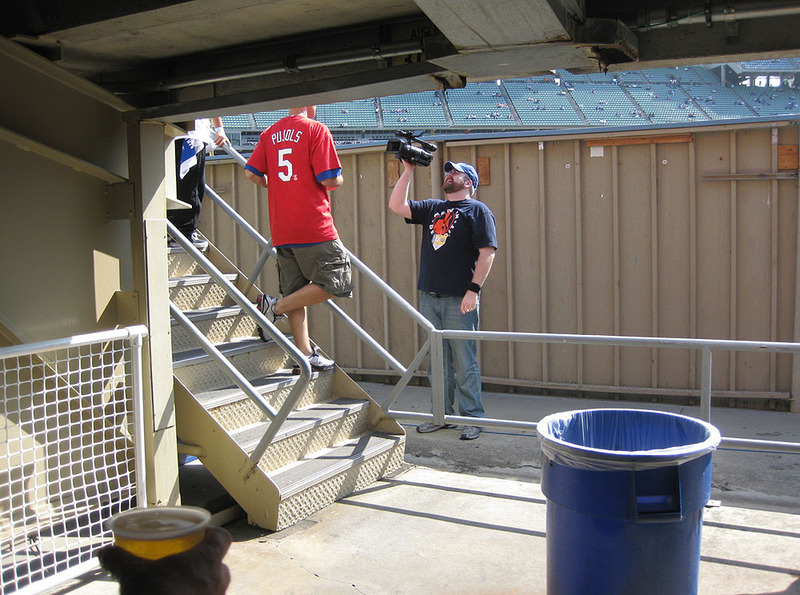 Once inside the stadium, my job was simple: snag as many balls as possible so that there’d be some exciting footage for the show. There wasn’t much action early on — I had a couple close calls — so I spent most of my time explaining things to the camera. There was an all-out scramble for the ball as it rattled around underneath the benches, and I managed to come up with it. Huge relief. Up until that point, I felt like I was personally letting down Conan — like I was a ballhawk fraud who’d made preposterous claims and then failed to back them up. I headed to the right field pavilion after that and snagged a home run that ricocheted down into the gap behind the wall. (I’m not sure who hit it.) Then, when Albert Pujols and Matt Holliday started taking their cuts, I raced back around to the left field side and positioned myself deep in the cross-aisle, more than 400 feet from home plate. Holiday hit two consecutive bombs that reached the aisle. I bolted to my right for the first one, but it sailed over my head and was promptly snatched by another fan. The second homer came closer to me, and I was able to climb over a few benches and reach out over the bullpen for a back-handed catch. The whole section booed me because of my clothing, so I lifted up my Cardinals shirt and revealed my Dodger Blue underneath. Some people laughed, some people cheered, some people continued booing, and some people were like, “Huh?” It was pretty funny. …but nothing else came my way. Right before the game started, I headed back into the main part of the stadium and got Mark DeRosa to toss me his warm-up ball behind the 1st base dugout. The guy in the photo above is named Jose (aka “Mannywood” and “Jose Being Manny” and he told me that he sometimes refers to himself as “The Mexican Zack Hample”). You can see more photos of him on MySpace and MyGameBalls.com. He’s a super-cool guy, and he always hangs out in the left field pavilion. The game itself was DAMN exciting, but it didn’t end the way I wanted. With two outs in the bottom of the 9th and the Dodgers trailing, 2-1, James Loney hit a line drive right at Holliday in left field. All Holliday had to do was catch it, and the game would’ve been over. The Cardinals would’ve evened up the series at one game apiece. But Holliday failed to make the catch. He said later that he never even saw the ball, and I believe him. As he charged in toward it, it nailed him in the stomach. Casey Blake then drew a nine-pitch walk and Ronnie Belliard followed by ripping the first pitch he saw into center field for a game-tying single. Everyone in the stadium was going nuts, but for different reasons; the other 51,818 fans were simply cheering on their beloved Dodgers. I, however, was ecstatic because it meant the game might go into extra innings, which meant I might get another chance to catch a home run. Russell Martin walked to load the bases, and then Mark Loretta ruined everything with a game-winning single. Final score: Dodgers 3, Cardinals 2. Good times. Playoff baseball is intense. • 532 balls in 59 games this season = 9.02 balls per game. …and here’s the article itself. Just got done watching your bit on the tonight show. I love Conan but he pissed me off in YOUR segment. You never got to say how much money you’ve actually raised because he kept interupting, and the other guy made him do the kid asking for a baseball again. I “liked” how the other guy was just laughing the whole time, basically mocking you. I’m over 2,000 miles away and it angered me quite a bit. They really didn’t give you much respect because you’re not a “celebrity” in their eyes. You do great work and raising over $10,000 for Pitch In For Baseball is huge, just another example of people not respecting ballhawks. YOU were great in the segment and came off as a good guy to me, they were just trying to portray you as a little kid. Did any of this stuff play out as I’m saying it or did you think they treated you with any respect? i enjoyed watching your segment on the tonight show. conan’s impression of a little kid was pretty funny and i liked how u, jeff garlin and conan all joked about each other. well done. Just caught the show Zack….you did well! It must be tough being in the middle of two hyper-comedic personalities, especially when the segment is going to be tight on time? All in all, nice job..enjoyed it! Hey, I watched Conan last night. I thought you were good. I was kind of pisssed that Conan interupted you, but he does that to all of his guests. I love Jeff Garlin, but he seemed to be mocking you. (Idk, maybe it was me.) Still, I could tell that you were getting frustrated. Anyway, I’m glad that you were good at least. O, and the ESPN.com article was SIMPLY AMAZING!!!!!!!!!!!!!!!!!!!!!!!!!!!!!!!!!!!!!!!!!!!!!!!!!!!!!!!!!!!!!!!!! I’m glad the part about your friends, and other people, mocking you was in there, because I’ve had the same problem. Ballhawking has had a negative impact on what my friends think of me, (My dad thinks I am strange even) but O well… Screw them!!!!!! Still it was really helpful to hear that you have gone through some of the same things… And of course there are still the “haters” on the comments section of the article. Sorry to say it, but Conan pwned you last night. Garlin made it tough for you, but you’ve been made fun of before for your ballhawking obsession so you should have been able to handle that better. Getting into a battle of witty banter with two professional comedians was a serious error on your part. Hopefully they’ll have you on again when the new book comes out so you can redeem yourself. In the meantime, hope you don’t stay too down on yourself for too long. Cool post. Sorry I missed the Tonight Show though. Maybe I can catch it online. Pretty nice to get a Loretta ball on that day. I came close to one in that shot right before I show you with yours. He almost NEVER hits homers in BP, but he hit at least two on Thursday. To Mikeyclement: I’m afraid your take on the show is totally wrong-headed. You say “Conan owned” Zack? You claim Zack should try to “redeem” himself? You patronizingly suggest Zack may be “down on”himself? HA! You missed all the subtlety of the dynamics between him and Conan and Garlin! Allow me to set you straight. I. No host should attempt to “own” a guest. A host’s job is to bring out a guest. Guest means someone who is to be treated with respect. Would you attempt to “own” a guest in your house? 2. But, Conan, contrary to good taste, DID, in fact, attempt to overpower Zack, because Conan is obsessed with being the funniest guy in the room. He has the ego of a short man. He is The Great Interrupter. He refused to let Zack answer his questions without doing a smart-*** dipsy-doodle in the middle. If you watched Zack on the Leno show last season, you saw a confident, secure host offering his guest the opportunity to shine, to tell his story, without the need to zing jokes off his head. 3. Zack did not try to “test his wit” against the other two pro comics. The comics, in their anxiety to get laughs, tried to diminish Zack for their own needs to top everything he said. They rudely, self-centeredly, sought to make it a Ha-ha Contest between two famous funny men and a baseball fan who was invited on the show precisely BECAUSE he’s a known baseball fan. But Zack, contrary to your upside- down take, instead was centered, confident, and bold enough, when Conan for the umpteenth time refused to let him finish answering a question, to command the manic host (was he on coke?) to take a Time Out! And in doing so, gave Conan the gift of being able to joke about his guest’s bravado. “You can’t say ‘Time Out’ on my show. Let me look at the rules picking up a sheet of paper and perusing it comically). No, it isn’t here!” BIG AUDIENCE LAUGH, COURTESY OF ZACK THE NON-COMIC. 4. Conan and Garlin were doing shtick. Zack, however, was authentic, speaking like a normal person, not a clown, trying to answer the host’s inquiries honestly and informatively. He was having a discussion, while the other two were having a ball. 5. Consider the potentially untenable position Zack was in: Garlin and Conan have known one another for 21 years. They’re buddies, former roommates, fellow celebrities, trying to gang up for fun on a sincere young man. Imagine yourself walking into a party where you know no one, confronted by two popular guys who are long-time pals. They decide to try to mess with your head, when you’re simply being ingenuous and friendly, with no agenda. WOULD YOU BE ABLE TO HANDLE THE SITUATION ? On the show, the two famous goombahs failed to score because Zack, the outsider, was not – as you mistakenly aver – trying to test his wit against theirs, but rather simply being straight, and in so-doing held his own – and then some. WATCH THE CLIP OF THAT INTERVIEW AGAIN – PUT YOURSELF IN ZACK’S SHOES – AND YOU’LL DISCOVER WHO OWNED WHOM: THE KID OUTSHINED HIS WOULD-BE TORMENTORS. Finally – why should he, as you wrongly assert – have to “redeem himself” or “feel down” on himself? That’s an assignment for Conan. I got so busy on Friday with my normal life on Friday that I forgot to Tivo your show!! Ooops. Too many doctor’s appts, kids volleyball games, family dinners and work. I did catch your segment online today though. Thank you NBC.com. Yeah, I’ll have to agree with some of the above posters. There was too much competition going on between the three of you to talk. Not a great appearance. I definitely liked your Jay appearance better. Did they make you dress down for the show? Did they make you wear what you would to bp including the hat? Just curious. Well, good luck with the rest of the postseason and finishing your new book over the winter. My surgery date is Nov. 4th. Wish me luck. Hey Boodleheimer1 – Well said! I second your analysis and agree that Zack did a remarkable job handling the situation. I wouldn’t know. I hardly ever watch his show. To say the least…yeah, it was a challenge. Yes, I was asked to wear that T-shirt, but if I had more time to prepare (and a better sense of style), I would’ve been able to wear something else (like an open dress shirt) over it.